Labour’s support has fallen to its lowest level since the general election. 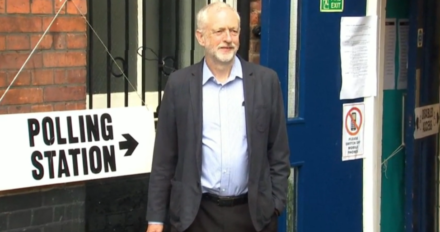 An opinion poll published today put Jeremy Corbyn’s party 18 points behind the Tories. The Guardian/ICM survey comes as a blow to Corbyn on the eve of a speech to launch Labour’s campaign for the local elections. Overall Labour were on 25 per cent, down one percentage point. The Tories are on 43 per cent, down two, despite Theresa May’s struggles over Brexit. There was a tie for third place, showing UKIP level with the anti-Brexit Liberal Democrats, on 11 per cent. Martin Boon, ICM director, said Labour’s support had only fallen this low in his firm’s Guardian polls on two previous occasions, when Gordon Brown was prime minister, in June and August 2009. Labour hopes to win a series of new “metro mayor” posts when the first elections are held alongside council votes on May 4. Conservatives 43 per cent (-2 points). Labour 25 per cent (-1). UKIP 11 per cent (+1). Lib Dems 11 per cent (+2). Greens 4 per cent (no change).